When we think about motorcycles, we right away think about exhilaration of biking on an open road. Biking is like a passion to many but it is also a very handy and comfortable mood of moving from one place from another for most people. Having a motorcycle needs you to take good care of it as well. If you are a motorcycle owner who leaves motorcycle on open air, you must be anxious about dust, dirt and rust covering your bike. Having a shed for motorcycle can solve your problem. If you already are searching for the perfect motorcycle shed for your bike, check out the following sheds for motorcycle available on Amazon in 2016. We have earlier mentioned few bike sheds you can use at outdoor at your house. 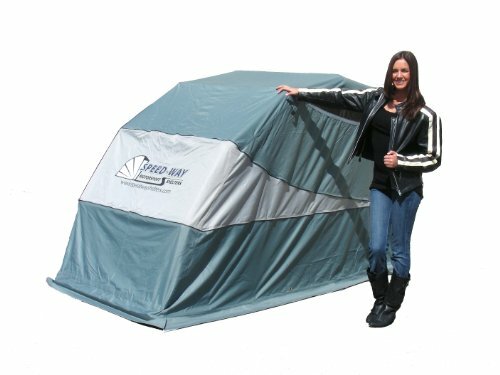 For camping lovers with your motobikes, here are few tents which can be transported easily by motorcycle. 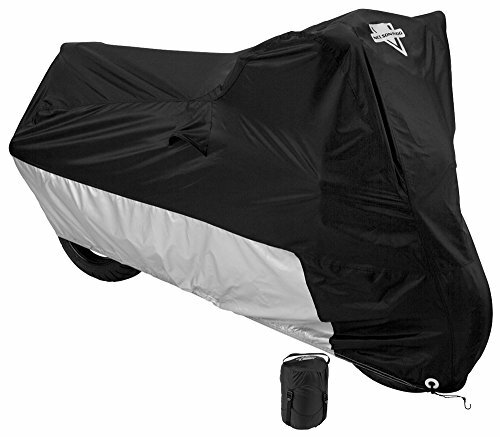 If you want simplest and most affordable solution to protect your motorcycle from water, dirt, dust and sunbeams, Nelson-Rigg All Season Motorcycle Cover can be a decent option. It’s always better to be safe than keeping your bike in open air. This is particularly recommended if you have a budget constraint. But this is surly not the best option when you can afford to increase your budget. The disadvantage with this cover is in humid weather, it can trap humidity in. But this is a portable and small storage shed for motorcycle. Based on the size of your bike you can pick from 4 different sizes available. The cover is made of water resistant light weight UV-treated Tri-Max polyester. So, you can expect to have a decent protection for your bike with one of these covers. This one is very easy to use bike cover designed to keep your bike safe from sunbeams, water, dirt and dust. You can park your bike wherever you want and all you need to do is riding the bike into the cover and closing the cover over the top. So, there is no way water or any dirt get into the cover. You can consider it as your private/custom motorcycle garage. One of the most notable of all its features is retractable roll-top which gives you safe and fast access to your bike. This is one of the best shed for motorcycle in 2016 you can think to purchase. The cover is made of strong and durable polyester fabric with 700mm polyurethane coating. It is fully taped seams for waterproofing as well. So, you can be completely assured that your motorcycle will be completely protected without waiting for the pipes to cool. For your continence, it comes in two different sizes. 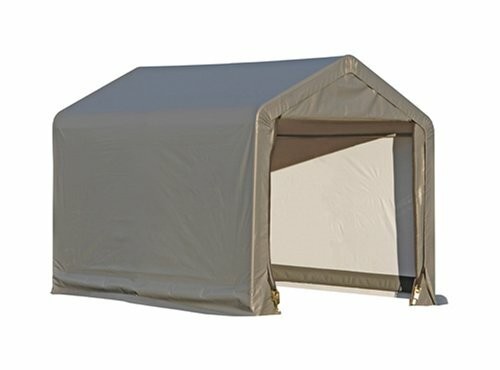 Motorsport Shelters by Speed-Way fits virtually any standard, scooters and sport motorcycles, many riding lawn mowers, cycles, ATVs. 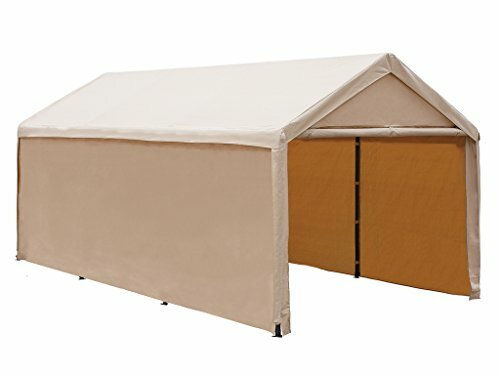 Affordable price, very easy to use, made of strong and durable polyester fabric and over 58 percent five star reviews makes it one of the most popular motorcycle sheds available on Amazon. This one gives you the largest variety in terms of size. There are six different sizes of it with 6 feet by 6 feet being the smallest and 12 feet by 12 feet being the largest. 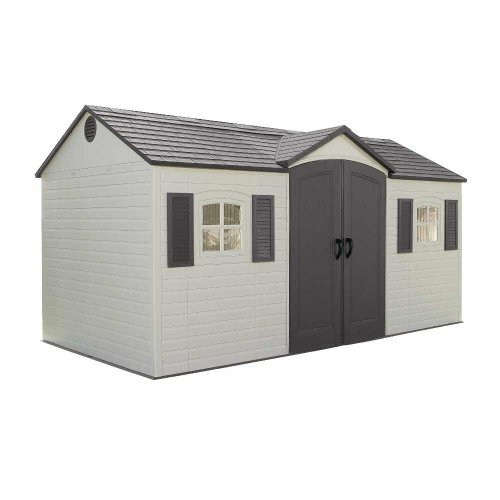 It is one of the best seller motorcycle sheds on Amazon as well. It has a great number of reviews among all the motorcycle sheds. If you buy one of the larger ones, you can expect to store multiple bikes. But if you want to store just a single small motorcycle, the smallest one will be most ideal. All sizes of Shelterlogic Shed-In-A-Box come up with a heavy duty 1-3/8-inch all steel frames, bonded with DuPont thermoset parched on powder coated finish which prevents corrosion, rust, peeling and chipping. The only disadvantage with these sheds is the installation might be a little tiresome. But once your shed is up, you can expect to store your bikes quite comfortably. This one does not look like a bike shed at all, still it can be one of the best options available for you. Its plastic construction will ensure you won’t have to do much for the maintenance. The price should be called reasonable because of its rigid construction and just enough space for your bike with shelves to accommodate some related accessories such as your helmet. The most important thing that you need to know is the shed is not designed to store bikes only. It is in fact ideal for storing bicycles, lawn mowers, and any kind of garden and lawn equipments. The outside depth of the shed is just 6.3ft. So, make sure you check the length of your motorcycle before making the final decision. This is another shed that can be useful for safe motorcycle storage but it is not designed to shelter only motorcycles. In fact, it is ideal for large storage such as motorcycles, autos, boats, horse shade. It can be used in commercial fair and outdoor events as well. 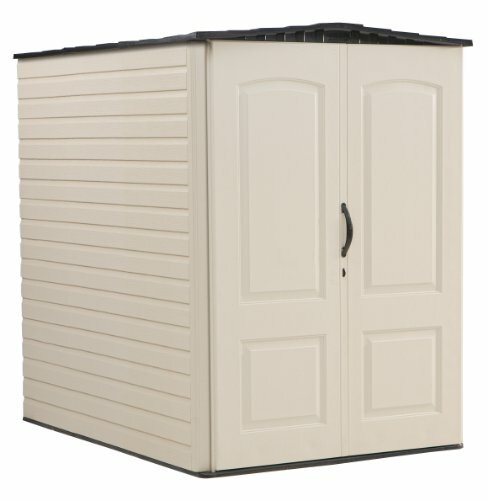 This 10×20 feet heavy duty shed is built with durable rust & corrosion resistant steel metals with two front zipped flaps for easy open/close. It’s very easy to set up and can be placed on any open surface. If you are a passionate biker with more than one bike, you should simply love it for the space inside the shed. When you have no budget constraint and you are looking for a permanent and “Complete” protection for your motorcycle, Lifetime 6446 Outdoor Storage Shed can be the solution for you. Plenty of space, superior strength and durability, ease of use, and completely leak proof make it the finest option to store a bike. Which motorcycle shed to buy will highly depend on the size of your bike, the budget you have and how you want to use the shed. So, check out the above mentioned sheds, compare one with another and make a well informed purchase decision today! Keep your motorcycle safe from dirt, dust, water and sunlight and be a responsible and careful biker! We hope this list of best storage sheds for motorcycle will give some ideas and help you in buying the suitable and cheap shed.